The Curriculum Vitae (also known as a vita or a CV) is your academic pedigree— it’s a list of your accomplishments across your entire academic career. Since the document grows with you, it’s not unusual for a graduate student going on the job market to have three, four, five, or more pages detailing every publication and research publication. A CV lists key academic qualifications: publications in top journals, research experience, teaching, education. Check out our resources for tips on when to use a CV or a résumé, and get tips on making your job application materials stand out. It’s a mistake to simply take the elements of the CV, move around a few items, and use it as a résumé when you're applying for non-academic jobs. Sending a simplified version of your CV, or listing all of your academic accomplishments is lazy. Don't make the mistake of trying to impress your reader with your degree! When your reader encounters the long list of publications, they’ll skim it at best; in a worst-case scenario, they'll put your résumé aside. It’s the experience and skills that makes you a great asset to their organization and that will impress your reader. Your résumé will look very different than your CV, from the order in which you list sections to how you talk about each experience. You’re editing for clarity and brevity so your reader can see at a glance that you’re a great fit for the job. Here's how to get started changing that CV into a résumé that gets you the interview—and hopefully the job. If it wasn’t clear above, here's the most important point again: Keep your reader in mind! A good résumé can be scanned in 30 seconds and draws the writer in. Don't bury information or expect your reader to read in between the lines! Strive to make your experiences accessible to readers who may not be familiar with academia. This means you’ll want to watch whether you use jargon, or if you describe your experiences in terms that someone from academia would easily recognize, but someone outside of your discipline would be lost. Your reader knows the profile of employees who have been successful at their organization, and will be evaluating your application with an eye on whether you'll be an asset to the team and fit well in the organization. The job ad is your key to unlocking what makes a good match—and helps you determine what to include on your résumé. Someone spent time formulating the job ad after considering what qualities a candidate will need to succeed. Each skill and quality they’ve included is significant. Spend a little time understanding what skills and qualifications they're looking for. Before you write a single word for your résumé, sit down with a hard copy of the ad and highlight each quality they’re looking for. Better yet, create a spreadsheet with each quality listed in one column. Then, in the next column, list what previous experience demonstrates that you have that quality. If you aren’t applying to one specific job, but you’re making your CV into a résumé for the first time, start looking at job ads for positions you're interested in. Patterns will emerge, and this will give you a better idea of what to include in your résumé and what to emphasize.
. . . if you are not certain what you want to tell the reader . . .
You can focus your reader's attention by using one of two résumé formats: the chronological résumé, which lists experience, skills, and education in reverse chronological order, or the functional résumé (sometimes called the organizational résumé) which clumps experience, skills, and education into different categories (for example, Communication, Data Systems, and Leadership). For some applicants, the functional résumé is a great choice, since it can make easy work for your reader, who's looking to see that you have key skills or qualifications. This is especially handy when you don't have a degree they've listed in the ad. If you have experience working with a team and coordinating volunteers, then a section titled Leadership would draw the reader's attention to your skill set. Similarly, a section called Data Management would be great for someone who worked in IT four or five years ago, but has more recent experience in an unrelated field, like teaching English literature. The Data Management section would be listed above degrees/education, so the reader can see at a glance that the applicant is qualified. Not content with one of these? Use them both! The combination résumé lists positions, employers, and dates, while also highlighting specific skills. If you go this route, Monster.com recommends focusing on accomplishments rather than job duties, and including only the information relevant to your career goal. Since the various sections of a combination résumé depend on previous experience, you'll want to look at a few examples and use your best judgment when deciding whether to include affiliations, training, and how to list education. When you’re moving from academia to the world of non-profits, industry, and government, you’ll need to show how those skills gained while a graduate student will be an asset to your future employer. For example, working in a lab develops leadership and teamwork skills (two highly sought-after skills). Listing your teaching skills and highlighting your efficacy in the classroom can demonstrate that you’re a great communicator. To translate your experiences into skills, reflect on each experience you’ve had in graduate school and each role you’ve played. Then, compare your list to a job ad and describe your skills and experience in their language. Use a few (no more than 5) bullets under each experience to explain what you did in that role to clearly communicate what you can do. By emphasizing skills you’ve used in each role, you’re creating more opportunities to match with the job ad, and get you one step closer to getting an interview. Looking for more examples for how to change your CV into a résumé? Check out Versatile PhD, which features résumés and applicants share how they got into their current careers. After you've drafted your résumé and set it aside for a few days, make sure it’s reader-friendly. Engage with the document critically. If you’re applying for a specific job, print out the list of skills and qualifications you made at the beginning and double-check that you’ve explicitly addressed each. If you’re expecting others to read between the lines to connect experiences to their minimum qualifications, revise your bullets so you’re explicit, ut keep it brief. This isn’t a literary work that your reader is sitting down to enjoy with a cup of coffee! The résumé must be easy to read at a glance. Check that your formatting is reader-friendly and simple. Mies van der Roh said, “Less is more,” and it’s true about résumé formatting. Use bold text and italics very sparingly. The less you use it, the more it stands out on the page. Use smart, descriptive headings and proper indentation to guide your reader and wisely incorporate white space. That’s right—the amount of space between text matters, too. It provides a spot for the eye to rest, making what you do have on the page stand out even more. The Director of Education oversees an ambitious schedule of educational programs for audiences of all ages. The position is responsible for planning and implementing programs including lectures, workshops and learning opportunities for adults; drop-in art activities for children and family workshops; seven to eight weeks of Summer Art Camp annually; and the extensive GRACE Art program, an art appreciation outreach program currently utilized by nearly 40 schools in the region. The Director of Education is also heavily involved in organizing activities for children and families during GRACE’s annual Northern Virginia Fine Arts Festival. The position is responsible for overseeing and implementing the Emerging Visions program for high-school youth, and the annual Youth Art Month exhibitions. The Director of Education will be expected to refine and promote existing programs, and develop new initiatives to further GRACE’s mission, in cooperation with the Executive Director. The ideal candidate will have substantive experience building, marketing, and overseeing visual arts education programs for both adults and children; a firm understanding of and experience working with the Fairfax County Public School System curriculum, teachers, students and administration; curriculum development experience; successful budget management experience; ability to interact with diverse populations and build partnerships; ability to work in a small team environment; ability to supervise volunteers and contracted staff; and a flexible, positive outlook. The Director of Education is responsible for managing and collaborating with the Education Assistant, Summer Art Camp staff, and select interns and volunteers. Occasional evening and weekend work is required for this position. BA or BFA in the visual arts, education, or a related field are required; MA, M.Ed or MFA preferred. 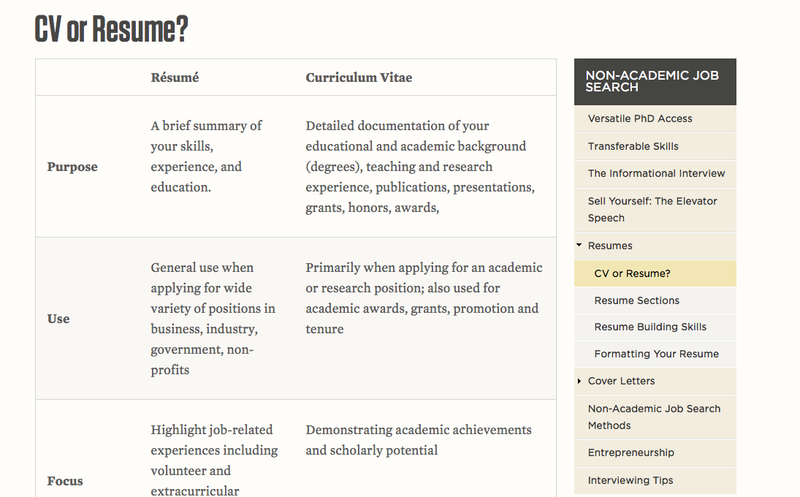 Let’s look at how two different graduate students can rewrite one line of their CV for a new résumé. Note that the job title in the résumé is more descriptive than in the CV. The first résumé bullet is more descriptive as well, and it uses words directly from the job ad. In the résumé, the second bullet identifies the budgeting experience of the candidate, while the third and fourth identify the group the graduate student worked with—which address the managerial qualities listed toward the bottom of the ad. The résumé format allows the applicant to more fully describe what responsibilities were a part of the residency. Since the reader may not be familiar with this particular program, it's vital that the applicant take advantage of the bullets to demonstrate how this prior experience prepares them for the position they're applying for.